© 2019 Al Abdulla SA, et al. This is an open-access article distributed under the terms of the Creative Commons Attribution License, which permits unrestricted use, distribution, and reproduction in any medium, provided the original author and source are credited. 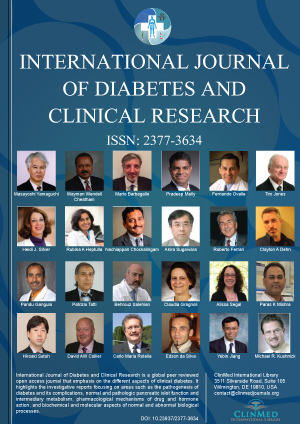 Diabetes Mellitus (DM) remains one of the world's most debilitating diseases. According to the World Health Organization, the prevalence of Diabetes Mellitus in Qatari Adult population is approximately 17%. By 2020, it will contribute to 7% of the total disease burden, and 10% of the mortality in Qatar. The burden of the disease is higher among Qatari National. "Qatari nationality was the strongest risk factor for DM" . Our aim is to try to study the association between key risk factors and the risk of having "Diabetic Status" defined as hemoglobin A1c >= 5.7 among Adult Qatari nationals. In addition, we tried to evaluate the impact of initiatives that encourage the adoption of healthier life style such as the Primary Health Care Corporation's SMART Clinics. The SMART clinic was firstly established at Al Wakra Health Center in the Southern region of Doha, Qatar. At the clinic individuals were screened for type II DM and depending on the outcome, a specific pathway was designed for them to follow ensuring patients and their families remained on the correct health initiative. A cross-sectional study design was used to study adult Qatari nationals registered at Al Wakra Health center's Smart Clinic using data obtained between (Jan 2015-Jan 2016). The sample chosen was based on inclusion and exclusion criteria. Using scaled hemoglobin A1c readings, participants were categorize into normal, pre-diabetic or diabetic ranges. We examined the association between key risk factors and having "Diabetic Status" using multiple logistic regression, and we estimated odd ratios and 95% confidence intervals. Using a paired sample T-Test we examined the before and after HbA1c mean levels to try to determine the effectiveness of the intervention introduced to pre-diabetic and diabetic participants. 3515 adult Qatari individuals were screened for type II DM. Out of them we chose 1876 subjects who had complete data on key risk variables to be studied. From multiple regression analysis we found that variables namely "Age, BMI, Blood Pressure, Central Obesity, HDL Level, and Cholesterol Level" were associated with a greater risk of having "Diabetic Status" (P < 0.05). Age group (>= 58) (OR = 7.822; 95% CI = 4.287-14.273; P = 0.000) when compared to the reference group (18-27). High Blood pressure (>= 140/90) (OR = 2.176; 95% CI = 1.520-3.177; P = 0.000) when compared to the reference group (BP < 140/90). HDL (< 1.03), OR = 1.917; 95% CI = 1.192-3.085; P = 0.007) when compared to the reference group (HDL > 1.55). Cholesterol level (> 6.2) (OR = 1.966; 95% CI = 1.174-3.293; P = 0.010) when compared to the reference group (<= 6.2). BMI >= 25 (OR = 1.555; 95% CI = 1.045-2.314; P = 0.029) when compared to the reference group (BMI < 25). Central Obesity (Males with waist circumference >= 102 cm, and females with waist circumference >= 88 cm) (OR = 1.370; 95% CI = 1.031-1.819; P = 0.030) when compared to the reference group (males WC < 102 cm, females WC < 88 cm). Variables "Gender, and Triglycerides level" did not have statistically significant association with the outcome "Diabetic Status". We found a statistically significant difference in the results of HbA1c mean levels among diabetic group before (M = 7.3, SD = 1.3), and after the intervention (M = 6.6, SD = 0.7), t (69) = 3.8, P = 0.000). And, we found statistically significant difference in the mean level of HbA1C levels among pre-diabetic group before (M = 5.9, SD = 0.2), and after the intervention (M = 5.8, SD = 0.4), t (545) = 4.961, P = 0.000). Trying to understand the relationship between key risk factors and type II DM is essential to inform and design preventive health initiatives targeting high-risk populations. Samya Ahmad Al Abdulla, Senior Consultant Family Physician, Executive Director of Operations, Primary Health Care Corporation, P.O. Box 26555 Doha, Qatar, Tel: +974-40271400.